This solution works well enough, but only provides minimal control over routing and wireless setup. Furthermore, WiFi range is limited and battery drain is significant. 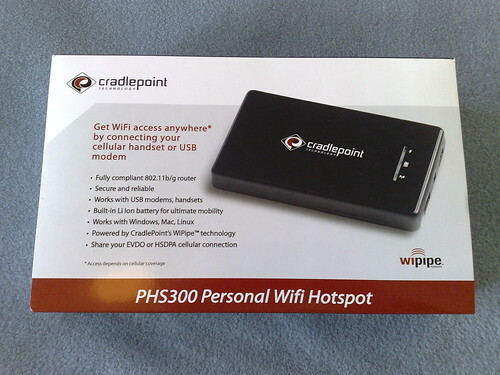 Enter the Cradlepoint PHS300, a battery/AC powered, pocketable, mobile wireless router designed to interface with a variety of USB 3G modems and phones. The PHS300 is a black box resembling a 2.5″ hard drive enclosure, and is equipped with a USB port, a power connector, and power switch. The top features 3 status LEDs (power, 3G, & WiFi) and the bottom hides a Li-ion battery behind a removable cover (see my unboxing pictures). Initial setup was as simple as inserting my AT&T SIM (MEdia Net data plan) into my Sierra Wireless AirCard 875U modem, plugging it into the USB port, and turning on the PSH300. Within seconds, all 3 LEDs turned green and an additional WiFi network appeared. After connecting my computer to this WiFi network and opening my web browser, I was greeted with a login screen. Once logged in (using the last 6 digits of the MAC address assigned to the PHS300), the web interface is similar to the one featured on most modern cable/DSL wireless routers. So I personalized the configuration, and I was immediately impressed with the routing features offered by the PHS300. The PHS300 supports PPP, DHCP, NAT with SPI, SSID enable/disable, Internet access control (services, URL, & MAC), 64/128-bit WEP, WPA/WPA2, WPA-PSK/WPA2-PSK, UPnP, multiple and concurrent VPN pass-through sessions (IPSEC, L2TP, & PPTP)… Hmmm, that’s quite a mouthful! Performance and stability are top notch. Battery life is about 2 hours, as advertised. If you need basic mobile routing for personal use, or a truly pocketable solution, I suggest you pick software like JoikuSpot (especially if you own a compatible smartphone). But if you need advanced mobile routing for a small group, or emergency routing for a small business. I highly recommend the PHS300.